Behold! My Nordic Goddess getup! Oh honey, you're supposed to take your dressing robe off before stepping out onto stage! Also, we have to have a talk about acceptable Miss Universe poses. That 'ta-da!!' pose just doesn't cut it. 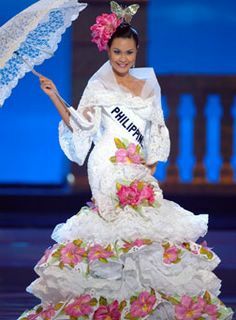 Finally, a national costume that actually looks like a national costume. It's not too bad, except for the giant yellow bouquet threatening to take over her head. The yellow doesn't really go with the outfit though. Miss China, are you paying attention here? This is how you should stand. A nice change from the regular kimono getup. I think they were going for the more tribal look of the Ainu people, or something like that. Aieee! Miss Korea is being taken over by the red-rose quilt of doom! And don't get me started on the hairdo. Selamat Datang! Welcome to Malaysia! It really looks like one of those costumes from the Tourism Malaysia ads. Those roses on the dress make her look like the little dolly on top of a wedding cake. I have no complaints about the costume, except she looks like she really has to go to the loo. ...And finally, we have Miss Singapore. I suppose for a country that has no national costume, this is really not too bad an attempt here. I forgive everything, except for the headdress. Eew. Despite the rain everyday, the early appearance of that time of the month, the lousy food, the too-soft beds, the return of my vertigo this morning (probably due to yesterday’s ferry ride), I had a great time in Bintan. I went there over the weekend with my cell group for our annual retreat. Some time for unplugging from the real world, reconnecting and getting deeper with God and all that jazz. It was my first time in Bintan, and I was really looking forward to it. We stayed at the Mana Mana resort, which wasn’t too bad. The rooms (or rather the beach huts) were very basic but at least they were clean and there was air-conditioning. I liked the day-beds which came with the rooms. In any case, we didn’t spend a lot of time in our rooms, just in there for showers and to sleep. We held our sessions at the resort’s one conference room, on the second level above the bar, overlooking the sea. The beach in itself wasn’t too fantastic, lots of brown sand. Maybe I’ve been spoiled by all the lovely white beaches at Gold Coast. But it was a lovely view and it was good to just sit and look out onto the horizon. All cell group retreats should be held by a beach. After a while, we realised that the more ridiculous the answer, the more chances that it was the correct answer. Balderdash is game that walks a fine line between sheer brilliance and sheer insanity. Yes, much useless information was gained, like I now know that the upper lip of a camel is a chiloma. ...I celebrated by getting click-happy at the Victoria's Secrets online store and ordered 5 (count them) tops. Arriving end June! Whee! * Yeah yeah I know Victoria's Secrets isn't in S'pore, but I am, and it's Sale season. Also cos I wasn't able to go to Charlie for the midnight sale last night. Not to complain or anything, but I'm really starting to slow down. And I'm only 26. If you were to look back to 3 years ago, my idea of a good Wed night was to head down to the now-closed Aubreys and listen to the band play. I'd head home when the place closed, most times around 2ish. And I would still be able to function properly at work the next day. But now? Oh no, no way jose. I need my beauty sleep. Just one late night out on a school-night is enough to send my sleep debt skyrocketing and I am a non-functioning unit the next day. Last night, I had dinner with Tania. We went to Riverwalk. We had intended to try this supposedly good and cheap ramen place at the Gallery Hotel, but it was closed (just our luck). So we walked around the corner and found this little Japanese cafe & book place called Bon Gout and had curry rice. Not too bad food, and they have a special every night. Also seems to be very popular with single Japanese men, who were there for dinner and for a fix of manga. We then moseyed along to Soundbar and had one drink (she had a mojito, I had a peach margarita). And after that one drink, we both professed to be tired and went home. At 9.30pm. The Story: I had only brought one pair of shoos to KL with me, and that was the pair I was wearing, a comfy pair of Dr Scholls. My dad and I had originally planned to go to Cilantro for dessert after dinner at Sao Nam (see last post), and while my dr scholls were completely acceptable for day wear and trudging around the malls looking extremely adorable, they just would not cut it for dinner time, especially at a classy joint like Cilantro. That being the case, I just had to go look for a suitable pair of shoos. As it turned out, we didn't go to Cilantro (#1 being we were too full, #2 being the restaurant is closed on Sundays), so it turns out buying this pair wasn't really necessary. Of course, I don't really believe that. There's always a reason to buy a new pair of shoos. As always when in KL, I ate a lot and shopped a lot. And I have the goods to back it up too. I made the rounds of my favourite malls (KL Plaza for F.O.S., Lot 10, KLCC and One Utama) and visited a new shopping centre, The Curve, and discovered a new store, called Kamiseta. At first, I thought it was a local brand, but on looking at the website, have discovered it’s a Filipino label. 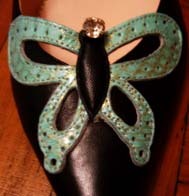 Lots of trendy casuals in pretty colours of blue, pink, green and red. Very summer-ready. I had to exercise restraint and in the end, narrowed my choices down to three tops. Hilton coffeehouse – Eh, it wasn’t great at all. I had taken the KLIA Express to Sentral to meet my father (incidentally, it’s a great ride and so fast! ), so we decided to have lunch at the Hilton for convenience sake. He had nasi lemak and I had the steak sandwich. Both very ho-hum. Not going back there! Friend’s house somewhere in Jln Pantai – I know, I know, it doesn’t count cos it’s not a restaurant, but such a good meal it was. I killed my throat with bbq chicken, pork ribs, steak, grilled sweet potato, noodles (since it’s a birthday), salad and birthday cake from Bakerzin, all washed down with some peppermint tea with honey. Oh, and her house is quite possibly the largest house I have been to in my life. Just the size of her bedroom (with walk-in wardrobe and bathroom) is probably ¾ the size of our apartment back home. Oversea restaurant, Jln Imbi – my favouritest Chinese restaurant in KL. No visit is complete without me partaking of their homemade tofu, char siew, steamed soon hock and the veggie soupy dish with century egg (I can never remember the proper name). The giant prawns are slurpilicious too. Ms Read, One Utama – I didn’t even know there was a café in the store! I guess it’s just like the Blood Brothers café here in S’pore. I had tea there with my friends and their mum and had the classic chocolate cake, a monstrously chocolatey mess of rich fudge sauce and vanilla ice-cream. I tried some of my friend’s banoffee pie and that was yummy too. Sao Nam, Tengkat Tong Shin – I’d wanted to visit this Vietnamese restaurant the last time I was in KL, but unluckily it was closed the day we went, and we had to settle for an Italian restaurant nearby. Ever since my days in Australia, I have developed a huge liking for Vietnamese food. Everything is so fresh and tasty. Unfortunately there aren’t many good Viet restaurants in S’pore; the only one I liked has since closed. We had the mangosteen salad, a fantastic tart taste sensation, the rice paper rolls, duck with orange sauce (some of that French influence I guess), salmon with dill (unusual but incredibly tasty) and the deep-fried eggplant. Was too full for dessert. Ah Koong’s Seafood Place, Jln Pudu - We wanted the pomfret soup, but they had run out of pomfret, so we had to settle for some other kind of fish. The best thing about this place is the outdoor setting where you pick and choose all your liao and then sit inside the icy-cold air-conditioned room and sip on longan tea while they get your order ready outside. I love taking the bee tai mak (or loh shee fun, as the Malaysians call it) soup with oysters, abalone, eggplant, loads of fish and veggies. Winter Warmers, The Curve – Cosy little English concept café with floral tablecloths and wooden furniture. I wouldn’t go back for the scones or the waffles (too soft and the jam tasted horrible), but I was so charmed by the way they served the iced tea. It comes in a little pitcher with a mini cocktail glass. I had the iced peach tea which came with some peach jelly. Great for a hot afternoon. I have been batoned by LMD so now you get to peep a little at what I listen to. A measly 148 MB - I don't keep music files on the 'puter. I save that space for manga. hurhur. The Story: If I were 7 years old and acting out the life of Cinderella/Sleeping Beauty/Snow White/other, (I had nightgowns catalogued according to which princess I wanted to be each particular night - the powder-blue one was for playing Sleeping Beauty, the lemon yellow with bunnies was Snow White etc. ), no doubt I would have wanted to be shod in these shoos as part of my Disney Princess Production/Musical of Princess Jasmine. Now that I am older and wiser, I of course do not need to pretend with nightgowns, I just pretend in my head. Anyway, that isn't the real story. The real story starts in the next paragraph. I brought these shoos with me on holiday to Australia in May 2002, and I realised they were quite the celebrities. Every shop I walked into had a shop assistant remark "Oooh! Those are so cute! Where did you get them?" and I would tell them I got them back home in Singapore, and they would therupon moan about the lack of nice and cheap shoos in Oz. In one of my rare entrepreneurial flashes, I am thinking how about a shoo tour to Singapore? If someone can organise singles holidays to Hong Kong to look for prospective partners, surely I can help girls find their dream shoos? "Come to the Dark Side where there are more chemicals than vegetables!" In anticipation of the upcoming Star Wars movie, I present to you...Store Wars! 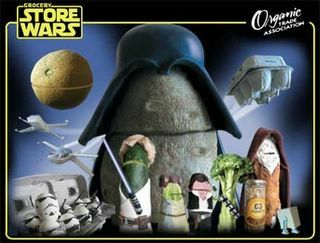 Witness characters such as Ham Solo, Princess Lettuce, Chewbroccoli and Obi Wan Canoli fight against the evil Darth 'Tater! This ModPod comes with a bag! Or maybe I have just gotten it mixed up. 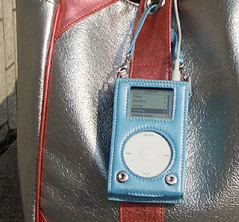 These retro-cool bags come with an ipod cover! Whatever...I must have one! The boo factor is they don't seem to have online buying available on their site. 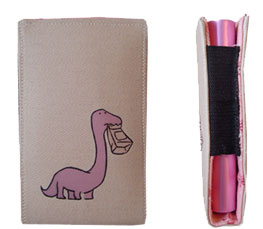 The website does say Urban Outfitters sells it though, but I can't seem to find them anywhere. 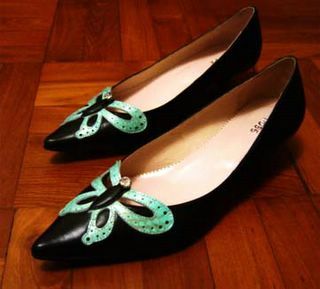 The Prie Pearl comes in grass green, cute pink and baby blue. 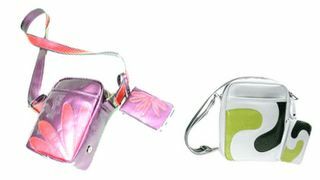 What I like are the long and short straps that come together with the casing, so you can sling or carry it like a little handbag. Stylish and simple with the white stripe. Can you tell I'm in a green phase? 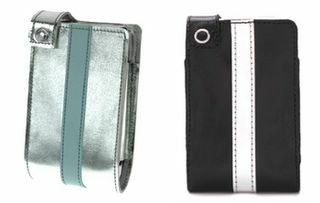 On the left, is icy-cool Iceland and on the right is retro-classic Christian. Mmm mmm. Squee! So many cute peels to choose from! Although I like the hungry dino (pictured above), I think I like Moomin best. 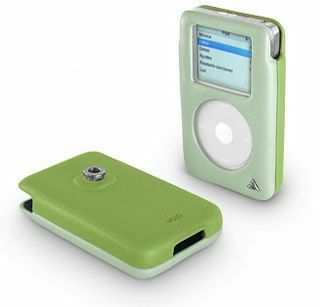 They come in difference sizes for mini ipods, and the regular 3G and 4G ones. 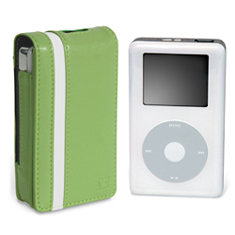 Also available are shuffle cases and a flip-case for those who don't want to take the pod out of the peel to change songs. ...doing all the exercises the neurologist recommended, The Natural Source Tropical Sugar Cane mineral salt rub, hanging out with friends and dad during the long weekend in KL, Square Pegs, Boots Daisy shower gel, ogling the Motorola Razr, Last Exile, getting a tan in Bintan, my new gold hoop earrings from Retail Therapy, breaking in the new Bree travel bag, listening to music on my iPod, the latest Star Wars movie, not taking physical health for granted. And with that, yes, I am back. That one week break was wonderful and really helped rest the head. I can't say this enough, but truly, the computer is an evil. It was so good I didn't want to come back to work. But oh well, all holidays must come to an end. I'm back at work today, and am feeling much better. Most of the dizziness has gone and I find that if I tilt my head to the left, the spinning is really slow and stops fairly quickly. But I still feel giddy when I look down for too long. Went to see a doctor (not the uni doctor, I think he was too laidback, probably he's so used to listening to bullsh it excuses from students) yesterday who took the recurrent vertigo more seriously and recommended I go see a neurologist. Appointment has been made and I'm going next Thurs morning. I hope it's nothing serious. What I'm really hoping is that I just need time to really recover. The doctor also did not think flying was a good idea and anyway, I was also a little apprehensive about what the pressure would do to my head. So my holiday has been cancelled. This sucketh mucheth. Will be taking half day and the rest of this and next week off. I hope I really recover and all this giddiness and spinning goes away. Permanently. Soooo, what I'm trying to say is - am taking a break from the 'puter. No updates and no shoo stories for a while. Sorry. See you in a bit.